IBM® Business Space powered by IBM WebSphere® is a common user interface framework for aggregating content and delivering it via a browser. A is a collection of related Web content that provides you with insight into your business. 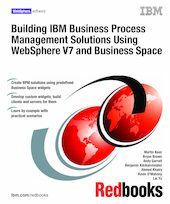 Part 1 of this IBM Redbooks® publication introduces Business Space and provides Business Process Management (BPM) usage patterns for it. Part 2 of this book use a fictional business scenario to show how business space widgets can be used to solve a variety of business problems, using products such as IBM WebSphere Process Server, IBM WebSphere Enterprise Service Bus, IBM WebSphere Business Monitor, IBM WebSphere Business Compass, and IBM WebSphere Business Services Fabric. Part 3 shows how to build custom Business Space widgets, and how to build clients and servers for these custom widgets. This book addresses Business Space powered by IBM WebSphere Version 7.0.